7.95 points at 21 votes (rank 91). The basic idea of Spherical is taken from the arcade classic Solomon's Key, (a puzzle game with skill intermezzos, which gets rather tricky in the higher levels and ties you to the screen for a long time), but many new ideas were taken into the game. The dragon Mirgal, who resides in level 79, wants to take over the world. There is only one weapon to destroy him: the magic Starball. 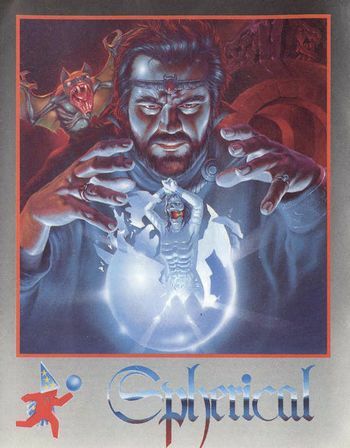 You are a magician whose task is to pave the way for a mystic rolling ball (Starball) through the different levels (together with the secret chambers over 100) to the dragon's castle. You can choose the route that you take mostly to your taste, but you need a charm of the same colour to remove a door or a stone that blocks parts of a level. The path of the ball is lined with stone blocks, which the magician (you) can make appear and disappear at any arbitrary place. Opponents of the magician are diverse ghosts and monsters, which take away his power by a mere touch. As a weapon you can use items that are hidden in different levels. There is e.g. a sparkler that conjures up a ball that destroys the enemies, items that change gravity and so make the Starball roll into the other direction, a magic wand that conjures you into the next level, a red bottle that destroys all enemies for a short time, a magic lantern that makes the magician invulnerable for a short time and much more. Very nice background graphics and many well-done sprites, exact and easy to learn controls, chooseable background music, every 10 levels a special enemy, a saveable highscore list, hidden bonus levels and as a mean end boss the dragon Mirgal, that fills almost the whole screen. Added to that are many well-elaborate levels, which can also be played in pairs (as a team). ... the dragon is defeated! H.T.W: "A really creative, ingenious idea for a game, to which you at first have get used to and into which you have to work yourself and which is still today lots of fun. One of the games by Rainbow Arts which you like to take out of the shelve often, though not such an addictive game as e.g. 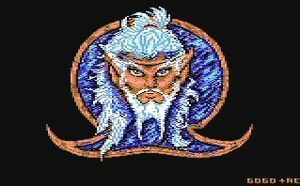 Turrican but with a magical something and its own charme. In the numerous levels you find anything that you can and cannot imagine. Ghosts, evil black magicians and sundry mean animals, candles that conjure up a small ball, which circles around the magician and destroys everything, an hourglass that lets Starball stand still longer at the beginning of a level. Keys that let doors (stones) of the same colour disappear when picking them up, switches which turn around gravity for the Starball. Scrolls on which a password is written, so you don't have to start again next time. Every ten levels there is a big intermediate boss which you have to either bypass or defeat with the help of the small ball. The game idea and the execution offers unequalled opportunities and the balance between levels in which you just have to be fast and skilled and the ones in which you have all the time in the world but which screws up your mind while trying to get the ball to its destination is just great. 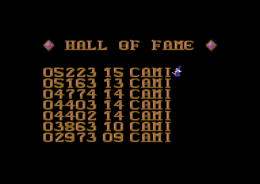 And yes, the music was created by Chris Hülsbeck and rings in its familiar quality and the graphics on the C64 are functional to lovingly done. For me a classic...". 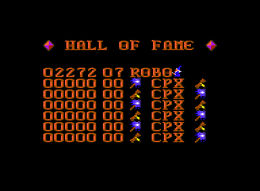 Robotron2084: "The parallels to Solomon's Key cannot be denied, but Spherical has enough own character not to pass as a dreary copy. In contrast to the model, there is more importance attached to planing than to action and skill here, sometimes the game is a bit sticky and bleak, but this is only my opinion. The choice if colour is sometimes really at the pain barrier. 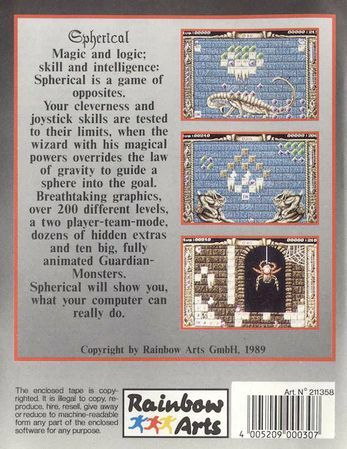 Spherical is in no case a bad game, but it does not really blow my mind. 6 out of 10 points." 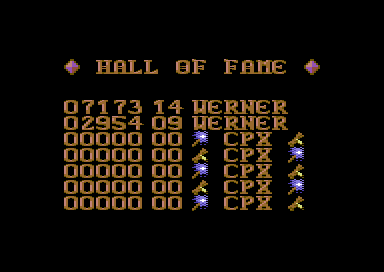 The C64 original disks of this game are equipped with aggressive copy protection, as it was often used by Rainbow Arts. This copy protection deletes the disk, when it seems to recognize that it is not original but a copy. With 30 year old disks, the slowly decaying magnetisation can already be enough to cause this uncomely effect. So if you love your original disk, you should take no risk and only use it with covered write-protect notch to be protected from this delete process. This page was last modified on 23 September 2017, at 22:52.